When sitting on a couch in your living room, sometimes a keyboard and mouse just won’t work comfortably on your lap. Read on to see if this keyboard with trackball can meet your needs. Founded in 2004, nMedia has set out to "create future home entertainment PC systems that are optimal for today’s consumer electronic gear" and to "transform the total home theater experience by intelligently converging digital entertainment AV functions, computer and networking technologies." Their vision of convergence of entertainment AV functions meshes very well with HTPCs, which are intended to be controlled by a remote in day to day operation. However, there are times when a keyboard and mouse make more sense. Thus, today we are going to take a look at nMedia’s newest wireless keyboard/trackball offering. This keyboard should look good in most HTPC setups. 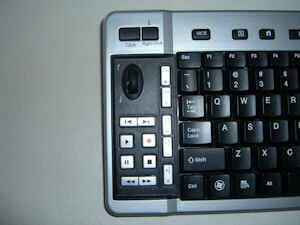 While nMedia’s previous keyboard, the MCESKB , had a blue trackball, this revision keeps the color scheme constant and elegant with its black keys and silver frame. Even the USB dongle blends in well with its coloring. Setup of this keyboard is a snap which the six paged instruction manual covers well. First, you need to put the included AA batteries into the back of the keyboard. Next, the USB receiver is plugged into the PC. Once it is attached, press the ID button on the dongle. Once pressed, the blue LED will start to blink. 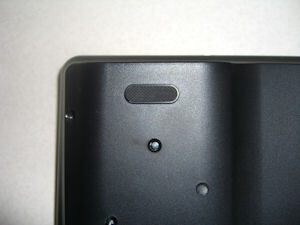 Then, press the ID button on the back of the keyboard, which will cause the LED to go out again. The 2 devices auto negotiate a channel and ID. There is no power switch that you need to turn on with this keyboard so I was typing away in literally 10 seconds. This keyboard uses short, laptop-style keys instead of what you may be accustomed to on a full sized keyboard. The keys do not need to travel as far so I found myself typing faster than normal. It did take some getting used to the positions of the extra keys like Page Up, Page Down, and End. These keys are located to the right of the Enter, Shift and \ keys. I would have rather seen Home, End, Page Up and Page down above the Backspace key and moved Print Screen, Scroll Lock and Pause above the number pad or placed them where Page Up, Page Down and End currently sit. The extra keys I found to be very well layed out. 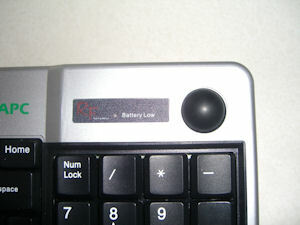 The left and right mouse buttons as well as a scroll wheel/ middle mouse button are located in the upper left corner of the keyboard, with the trackball located in the upper right. This provides a very good balance when surfing the web or other mouse heavy activities with the keyboard on your lap. New to this keyboard are the Media Center keys located across the top. These keys include My TV, My Video, My Picture, My Music and Live TV. There’s also a button for launching MCE, closing an application window, and launching Internet Explorer (or going to your homepage if IE is already open). 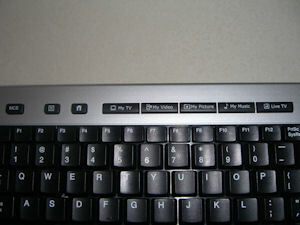 Along the left side of the keyboard are a set of keys that replace the need of a remote control. These keys are Channel Up, Channel Down, Volume Up, Volume Down, Previous Track, Next Track, Play, Record, Pause, Stop, Fast Forward and Reverse. These keys don’t match any standard layout that I’ve seen before, however they are grouped well so that they are easy to use without looking down once you get used to how they are positioned. In all of this, no driver is necessary to use any of the extra keys. They are all recognized immediately by the OS. They trackball has a nice feel to it but the ball seems a little light making it feel slightly lower in quality. I was, however, not able to make an indentation in it while squeezing it in my hands so it is certainly sturdy. The light weight does cause precision mousing to be slightly more challenging than it might otherwise be. The ball is tracked optically instead of by rollers so it will not need to be cleaned often. If you do need to clean it off however, you will need to remove all of the screws on the backside of the keyboard to do it. Inside they keyboard casing, there is a piece of felt that sits around the trackball opening to brush off any debris that might be on the ball to help keep it clean. Unlike the previous nMedia keyboard offering, the MCEKB does not use legs to position the keys to the correct ergonomic height. Instead the body of the keyboard does this, which makes using it on your lap much easier. While there are no hand holds on the sides for gripping when using the trackball, the sides of the keyboard are curved, creating a very natural and comfortable hold. 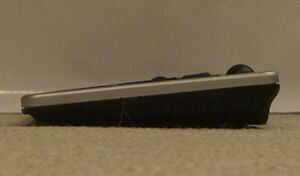 The bottom of the keyboard also has two channels that your legs rest in providing a very stable typing surface. When being used at a desk, the keyboard also has four rubber feet, one in each corner, making sure that this keyboard does not slide around. The keyboard was tested in several different environments. It performed well through walls and floors at distances up to 50 feet. Since this keyboard is based on RF technology, line of sight was not an issue. You should not run into complications due to range with this keyboard in most home theater environments. 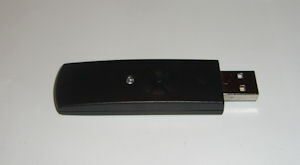 Using the same testing methodology mentioned in John’s review of the nMedia MCESKB, this keyboard was tested in environments with cordless phones, and 802.11g wireless networks to see how it would respond. In none of these situations was performance noticeably impacted. Creating a keyboard that does everything for everyone is difficult, but nMedia is definitely on the right track with the MCEKB. While most day to day operation of an HTPC will be done with a remote, this keyboard comes in handy for those web surfing or maintenance needs. And if you do not already have a remote for your HTPC, the one built into this keyboard functions very well. 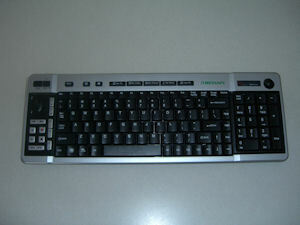 Unlike the last nMedia keyboard , this one does not have a power switch. However, the power management features built into this keyboard work quite well. While not specifically timed, the keyboard goes into a powerdown state after sitting idle for 1-2 minutes. When you are ready to start using it again, it’s a simple matter of pressing any key to wake it up (moving the trackball does not do it because the optical sensor is turned off also). Once the key is pressed, the keyboard wakes up very quickly and there is really no delay before you can start typing away again. 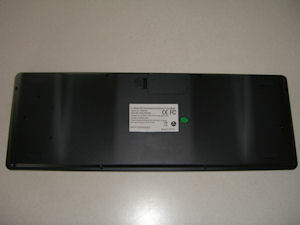 According to the documentation, a set of batteries should last around three months. There is also a low battery indicator located next to the trackball that turns on when it is time to change the batteries. 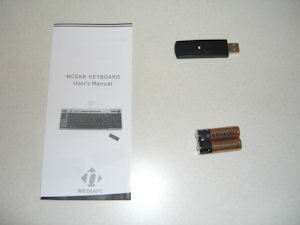 nMedia even steps up and includes a set with the keyboard. The dongle of course does not use batteries, receiving its power directly from the USB port. All of the keys are good quality and have good feedback in my opinion. The layout of the extra keys is well done making it easy to use them without having to look down all the time. The trackball seems a little bit light but does a good job most of the time. Very precise mouse control is a little difficult at times. The keyboard itself is also very comfortable to hold when using the trackball and mouse buttons. This is a nice improvement over the last offering. As a whole, the keyboard feels very solid. Having tested this keyboard as far across the house as I could get, through walls and floors, range should not be an issue when using this keyboard. Even at farther distances the keyboard remained quite responsive. It did not appear to have issues sharing the 2.4 GHz frequency with other electronic devices. Overall I think this is a well thought out keyboard and would definitely recommend it to anyone looking to add a wireless keyboard to their home theater setup without taking out a loan on their car or house. « Xbox360 Getting More Multimedia Fun?